The Gstaad-Saanenland holiday region in the Bernese Oberland is popular with a wide range of visitors: while the chalet village of Gstaad has long been popular with the rich and famous, the smaller neighbouring villages offer attractive options for families with children. With its top hotels, gourmet restaurants, luxury chalets and nearby Saanen airport, the car-free resort of Gstaad is a popular destination for international celebrities. With the neighbouring resorts of Saanen, Rougemont, Schönried, Saanenmöser, Zweisimmen, Gsteig and Lauenen, the Saanenland as a whole however offers a considerably broader spectrum: the nature preserve by idyllic Lake Lauenen with its waterfalls and high moors, the narrow streets in the historic village centre of Saanen, the advantageous situation of Schönried and Saanenmöser for winter sports enthusiasts and the peacefulness of the idyllic mountain village of Abländschen are examples of an extremely diverse holiday region. 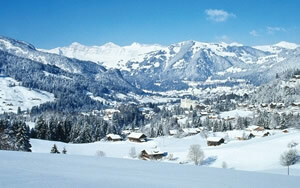 The Saanenland ski and hiking arena with over 60 transport facilities has been given the name "Mountain Rides". It is accessible from several villages by link transport facilities. The Montreux-Oberland-Railways (MOB) and buses connect Gstaad with other base stations in Saanenmöser, Schönried, Zweisimmen, Gsteig, Reusch, Lauenen Rougemont and Château-d'Oex in the French-speaking neighbouring region of Pays d'Enhaut. For summer stays, the wide-open countryside of the Saanenland offers a versatile and and diverse sports programme: hiking (trail network of over 300 km), mountain biking, paragliding and golf. On the River Saane there are opportunities for mountain torrent and canoo adventures. Summer cross-country skiing is possible in the "Glacier 3000" ski region. The summer toboggan run in Schönried, a via ferrata and the Lake Lauenen nature paradise are ideal excursion destinations for families. restaurants, bars and cafes to suit a variety of tastes. former haunt of the rich and famous, with exclusive hotels and chalets. Quaint village atmosphere, winter walking trails.